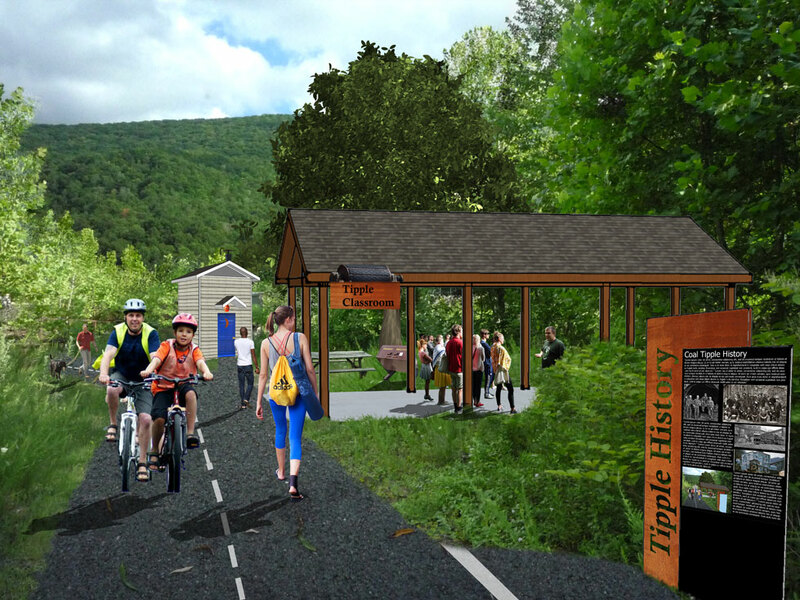 Rendering of the planned Riverview walking and biking trail in Norton, Va., at the site of an old coal tipple. Last month, Congress passed an omnibus spending bill that keeps the government running through September 30. But, unlike recent continuing resolutions, the bill includes new spending. Although the Trump administration’s budget proposal recommended cutting a number of federal programs that serve Appalachian residents – both environmentally and economically – Congress instead maintained or increased funding for many of them. The Appalachian Regional Commission, a regional economic development agency, saw its annual budget rise by $9 million, going from $146 million to $155 million. The Economic Development Administration received $30 million specifically to provide development grants to struggling coal communities across the country, including those dealing with the closures of coal fired power plants. And several energy efficiency programs, including the Low Income Home Energy Assistance Program, were funded at equal or higher levels than in the previous year. In an important move, Congress also renewed the Abandoned Mine Land Pilot Program, which provides funding for states to clean up abandoned coal mines and repurpose the sites for economic use. Kentucky, West Virginia and Pennsylvania will each receive $25 million through the program, and Virginia, Ohio, Alabama and designated Native American tribes will each receive $10 million. On the flip side, though, we are disappointed that the spending bill did not include the RECLAIM Act (H.R. 1731). Similar in purpose to the pilot program, the bill would accelerate the spending of $1 billion from the Abandoned Mine Lands Fund to clean up and repurpose old coal mine sites to benefit local economies. Every penny of that $1 billion has already been collected from coal companies to be used specifically for the reclamation of coal mines abandoned before 1977. The RECLAIM bill is being spearheaded by Rep. Hal Rogers and has 40 bipartisan cosponsors, ranging from Appalachian Republicans to California Democrats. Appalachian Voices and other economic development and environmental advocates pushed hard to include the bill as part of the omnibus spending package, ensuring the funds would be invested in communities now, when they most need it as the country continues to transition away from coal. While the bill is supported by nearly the entire Appalachian congressional delegation, coal industry lobbyists, led by the National Mining Association, fought hard against the legislation. Largely because of their lobbying efforts, House Speaker Paul Ryan (WI) has prevented the bill from proceeding to the House floor for a vote, where we are confident it would pass. Senate Majority Leader Mitch McConnell (KY) is a supporter of the RECLAIM Act — in theory. It must be noted that he did very little to get RECLAIM included in the omnibus. Despite constant encouragement from his constituents, including reclamation contractors, county elected officials, faith leaders, and community members, McConnell has so far failed to use his considerable influence to pass RECLAIM. Overall, the omnibus spending bill was as about as good for Appalachia as we could have hoped — especially given the apparent determination of the White House to gut investments in the region. As disappointed as we are that the RECLAIM Act was not part of the omnibus bill, it would be a shame to overlook the enormous investments being made in the region through other agencies. We will continue to push for passage of the RECLAIM Act, and continue to advocate for sufficient investments in environmental and economic programs that benefit our region.